President Trump said Friday he is nominating William Barr – who served in the first Bush administration – to replace former U.S. Attorney General Jeff Sessions, who was an outspoken critic of marijuana legalization. 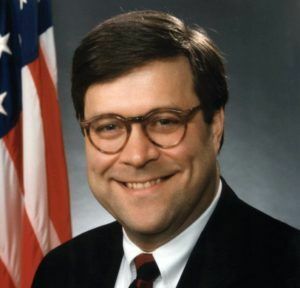 Barr, who served as attorney general for two years under late President George H.W. Bush, was known in the early 1990s for a tough approach toward drug offenders. But it’s unclear where Barr now stands on marijuana policy. He recently served in a number of senior-level corporate positions and is currently a lawyer in the Washington DC office of Kirkland & Ellis. The Senate must confirm Barr, a process that could take weeks or perhaps months. Cannabis industry attorneys reckon Barr will be no more hostile toward the MJ industry than his predecessor – and may well be less strident. Sessions, who once said “good people don’t smoke marijuana,” alarmed the MJ industry by removing Obama-era protections for state-legal MJ businesses. “As contrasted to Sessions, who had a rich history as a drug warrior and firmly held beliefs to fully enforce the federal law, (Barr) will be more moderate. He brings no agenda,” Pennsylvania cannabis attorney Steve Schain said. In a recent interview with Marijuana Business Daily, cannabis attorney Henry Wykowski echoed Schain’s assessment. “I can’t imagine whoever his successor is would be any worse,” he said. As it turned out, Sessions’ bark was bigger than his bite: The former attorney general didn’t take much action against the state-legal MJ industry. But the very threat to do so had a detrimental effect on the industry, Wykowski said. He said he knew banks that quit doing business with state-legal MJ enterprises after Sessions rescinded the Obama-era Cole memo, which had instructed U.S. attorneys to adopt a hands-off policy toward state-legal marijuana because of the government’s limited resources. “The rescission (of the Cole memo) had a chilling effect,” Wykowski said. Sessions had his hands tied, at least when it came to cracking down on state-legal medical cannabis businesses. During his tenure, Congress continued to extend the Rohrabacher-Blumenauer Amendment (now the Joyce Amendment), which barred the Justice Department from spending resources to go after state-legal MMJ businesses. Acting Attorney General Matthew Whitaker, a former U.S. attorney in Iowa, came into his position with a reputation as a hardliner toward drug offenders. But Whitaker hasn’t articulated a desire to take action against MJ businesses so far during his tenure as acting AG. His stint instead has been embroiled in controversies concerning whether he was a legal appointment in the first place and whether he had a conflict of interest in overseeing Robert Mueller’s investigation of Russia’s attempts to interfere with the 2016 elections. President Trump has said he would “probably support” the STATES (Strengthening the Tenth Amendment Through Entrusting States) Act, which give states the right to determine their own marijuana policies, without interference from the federal government. Looking ahead, Denver cannabis attorney Rachel Gillette is taking a “wait and see” toward the choice of Barr. Gillette noted that Barr, if confirmed, “obviously will have some major issues that he’ll be dealing with that are unrelated to cannabis. A recent Pew Research Center poll found that two-thirds of Americans now favor marijuana legalization. Thank you for an even handed and fair minded approach to the news. Keeping it positive has an effect that radiates outward. We must move forward expecting that the normalization process will evolve in a direction opposite the trillion dollars and countless lives wasted on the “War On Drugs”. The industry as a whole will benefit from normalized market forces of supply and demand and civilized capital cost. Ideas and technique should be the drivers of success as opposed to huge money and brute force which now determine the ‘winners’. there are so many other, more important issues to be prosecuting than people who’s lives are made better by an organic plant, one that can even replace opioids for pain relief. Trump understands this, and knows also that it is good for states economy. one would expect that our president would instruct the new AG to leave the states alone in this area. The total legislation of cannabis in Canada will continue to change the past, misinformation campaigns. Millions of Americans continue to realize there is much to be gained, and little if anything to fear from legal marijuana. I see nothing here about anyone trying to call him and ask. Good news that he’ll be less strident. Canada is setting the blueprint for the US and legalization of marijuana!